FREE SHIPPING ANYWHERE IN THE CONTINENTAL U.S. YOU'RE CLEANER WITH COPPERTOUCH! FREE SHIPPING ANYWHERE IN THE CONTINENTAL U.S. - YOU'RE CLEANER WITH COPPERTOUCH! While copper certainly isn’t something new, its uses have evolved. 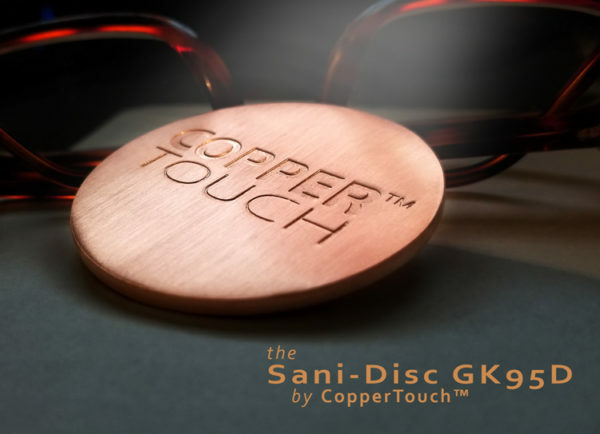 The new CopperTouch Sani-Disc GK95D is a simple yet most effective example of just how much we have come to understand this. Using the GK95D as you would a bar of soap for just about sixty (60) seconds kills no less than 94% of dangerous bacteria, including the most common types as well as the antibiotic-resistant strains. It’s the germ killer elite. Made of some of the best stuff found in nature, the 99.9% copper, beautifully crafted CopperTouch GK95 is 2.5 x 1 7/8 x 0.4in (6.5 x 4.5 x 1.5cm). So sleek and slim it can easily slide into a pocket or purse. The familiar oval shape and rounded edges make for a most comfortable fit in your hand. Not only does it feel good on the skin while rubbing, it makes a good sensory object to fidget with. Use it as you would a bar of soap – wiping the palms, in between the fingers and the back of the hands thoroughly for about 60 seconds. As an added bonus, it has an odor killing property as well, so food smells and even cigarette smoke odors on the hands are eliminated along with germs. In 2008, the EPA ran thorough tests examining these unique properties of copper. They determined that if there were a metal with at least 60% copper in the mix, it would have all the antimicrobial properties of a solid copper. They studied 300 different combinations of metals. This is one with excellent performance. 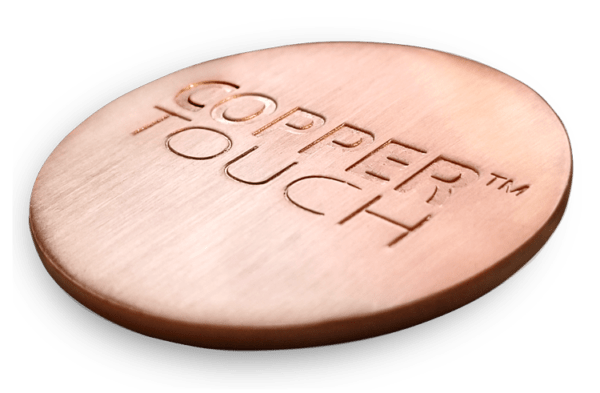 Testing by an independent laboratory that specializes in antimicrobial properties determined that the copper piece designed herein would kill up to 94% of the microbes on your hands with 60 seconds of rubbing. Killed were such microbes as the Staphylococcus aureus. Other published results indicate killing of Salmonella, Listeria and Influenza type A. 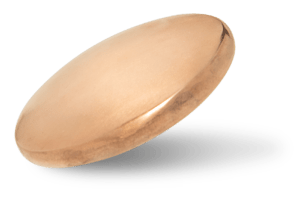 The copper piece should not be waxed, painted or lacquered because that will disturb the antimicrobial properties of the copper. Routine cleaning to remove dirt is encouraged simply for good sanitation. The mechanism for killing the microbes by the copper continues to be studied. But there is consensus that the membrane around the microbe is damaged when in contact with the copper partially due to the high conductivity of copper. When the membrane no longer protects the microbe, its life is over. After perforation, copper can inhibit any given enzyme that stands in its way, and stop the cell from digesting nutrients, from repairing its damaged membrane, from breathing or from multiplying. actually recommends a daily allowance of 0.9mg of copper a day to be ingested as a part of a normal diet or supplement. Copper is wear resistant and can be formed into many useful products, while maintaining its antimicrobial properties. CopperTouch took this beautiful, durable, antimicrobial metal and formed it into a portable, hand held piece that can be carried anywhere. Our ancestors may not have understood “antimicrobial” properties while they were using copper, but they did realize that water held or carried in buckets made of copper or copper alloys was not slimy when compared to water held or carried in buckets made of wood. Through time, we learned that copper piping provided water of greater clarity and less odor than many other piping materials. Copper has been and is still used in construction for roofing or placed in strips in the top rows of roofing shingles to reduce or eliminate mold growth. Additionally copper is used in marinas, particularly in brass form, to prevent the accumulation of microorganisms, plants and algae from forming on boat hulls and surfaces. …all the germs they are carrying with them everywhere they go; Many taking their purse directly from the bathroom floor to the restaurant table or their kitchen counter. Researchers swabbed handbags to find the dirtiest parts. Twenty percent of handbags swabbed had levels of bacteria-related contamination which could potentially cross-contaminate other surfaces — and contained more germs than the average toilet flush, CBS New York reported. The items inside the purse didn’t fair well either. Swabs revealed that face or hand cream were the most-bacteria ridden items, followed by lipstick and mascara. Did you know that every 60 seconds, a working adult might touch as many as 30 objects which may be contaminated by bacteria or viruses that can cause infectious disease? It is recommended that purses be cleaned regularly, including the sides, bottom, handles and contents. The same goes for backpacks and brief cases! Just as important, when using bags of any kind, your hands should be cleaned as often as you use them. It is difficult to take soap and water with you everywhere you go. More and more we try to avoid chemicals for our health. CopperTouch can go with you and stay with you so you can help fight those germs before and after using those wonderful hand bags! These wondrous, electronic lifelines of ours are usually kept pretty warm too, and not just by the battery inside. Given that they’re most likely being held a lot, or in a pocket drawing additional body heat, all this warmth and moisture provides an excellent breeding ground for bacteria. Then of course we press the phone to our faces to use it. Well, you get the picture. As a rule we might wipe smeared fingerprints off the screen, but it’s not often, if ever, that we take the time to disinfect it. Studies have shown that cell phones can carry more germs than toilets! Such shocking revelations may lead to educational campaigns to raise awareness or even to the restriction of mobile phone usage in clinically sensitive areas in hospitals, etc. Next time you take out your cell phone, think about all the germs that it has come in contact with. You touch and swipe it, hand it to friends to show pictures, lay it down on available surfaces, touch everything else in the world and then go back to the cell phone. It’s clear that we should all be a bit more attentive when it comes to taking care to clean our constant companion. CopperTouch is leading the charge in the war against germs and the new revolution of antimicrobial products. Anything you pick up is basically a cesspool and a potential disaster waiting to happen. The free weights, exercise balls, the mats. They can all be the cause of skin infections, or colds and flu, or much more serious illnesses. While some gym users do considerately wipe the equipment down, most do not know about contact or “kill time.” For most common infectious bacteria, disinfectant wipes or spray need to keep the surface wet for at least 1 full minute without evaporating. Some up to 5 minutes, depending on the product. Look at the surface when you clean your equipment with a disinfectant wipe. Did the surface stay wet enough long enough? If not, your wipe may not have killed as many germs as you thought, and the most frequent place you would pick them up – are your hands. The Clinical Journal of Sports Medicine found that 63 percent of all gym equipment is contaminated with rhinovirus, which causes the common cold. Norovirus, a highly contagious virus that triggers stomach cramps, vomiting, and diarrhea can spread through small droplets that travel through the air before settling on surfaces such as gym equipment. While they don’t thrive as successfully on porous materials like tissues and fabrics, noroviruses can survive on hard surfaces for days or weeks if the conditions are favorable. Of course that shouldn’t stop you from getting your workout on. It isn’t about avoidance, it’s about being conscious of the environment, taking certain precautions like cleaning the handles, seat and metal parts of the equipment as well as the touchscreens, and practicing good hygiene to lessen the chances of picking up what others may have put down. So let’s go to the gym and take your CopperTouch products with you to help get rid of those dangerous germs on your hands, so you can stay healthy! Our routines rotate around normal daily hygiene and cleaning surfaces, but when we get out into the world where germs and bacteria from many sources are waiting for us, what do we do? Copper’s natural antimicrobial abilities allow us to carry it with us making it readily available wherever we need it. Not only can you have peace of mind that you are clean, you didn’t have to use chemicals to get rid of those nasty germs. Getting sick can cost you a lot of money. Time away from work, doctor visits and medications all add up quickly. 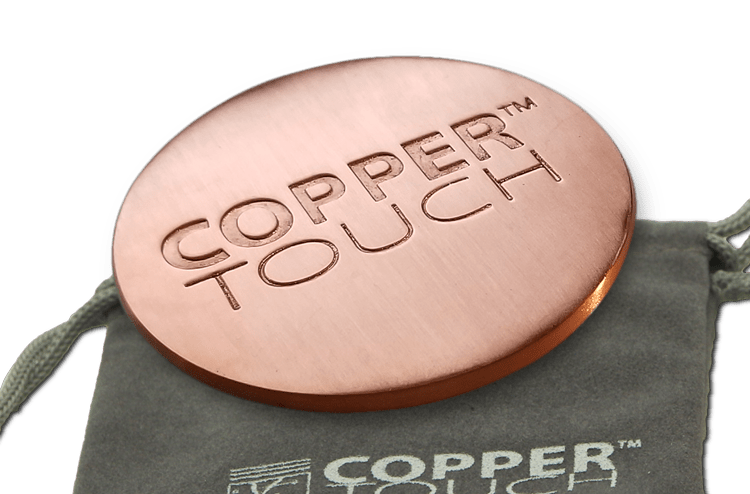 By carrying CopperTouch in your pocket, you will have extra security against even the most dangerous germs and viruses. “Whether germs are viral, bacterial, or fungal, some can remain active on most surfaces for several days — no matter whether the surface is stainless steel, wood, plastic, or even the paper in a magazine,” says Elaine Jong, MD, co-director of the University of Washington Travel Clinic in Seattle. The best way to prevent problems, of course, is to never touch these “problem” surfaces. But that’s not so easy.